Richard and I have been downsizing our possessions lately. Dreams of being able to one day live in a tiny house dance in our head. The reality of how much more focused and lighter life is without the burden of sharing a home with things we don't value is also keeping us grounded in the project. I can't help but feel we're making space for magical possibilities too. A few days ago I outed myself to Richard that I was storing roller skates that I hadn't worn in ten years in our attic. "You never know when you're going to be invited to a roller disco party," I argued with all seriousness. Then I heard myself. The skates have to go. 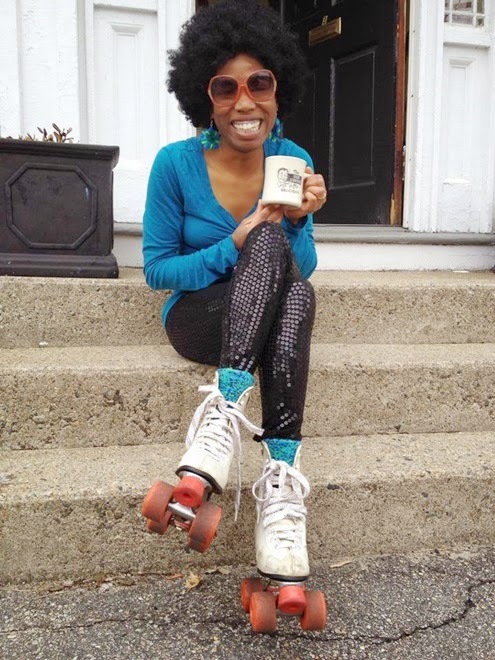 Richard and I found inspiration for a disco video tribute to the roller skates while taking a long, hazelnut mocha latte fueled walk after brunch. I'll always remember my skates thanks to this video. If I'm ever invited to a roller disco dance party I look forward to renting a pair of skates and having the best time ever! Spring cleaning does not have to be boring or painful. It can be a process that connects you to your authentic self. My authentic self loves home movies, costumes, dancing, and making people smile. I don't need to hold on to the skates to make this happen again. The authentic self is very good at creating these opportunities if you give her love and room to play. How do you hold on to memories but get rid of the stuff? Share your style or get style inspiration from other bloggers by joining the fun at The Pleated Poppy. It's a process so love yourself as you make progress at your own pace. Thanks for commenting!